Our Grandpa Heavenly Blessings Personalized Sweatshirts are available on our premium white cotton/poly blend Customizable Sweatshirts, machine washable in adult sizes S-3XL. Also available in Ash Gray. Includes FREE Personalization! 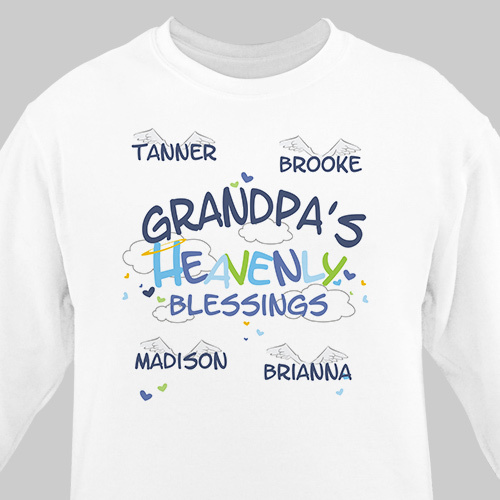 Personalize your Heavenly Blessings Grandpa Sweatshirt with Any Title and Up To 30 Names. The sweatshirt turned out really well. I was pleased. This is my second "Heavenly Blessings" sweatshirt I bought. The first one was for my Mom for Mothers Day and she cried with joy when she opened it! This one is for my Dad for Fathers Day and I'm sure he'll love it just as much!